From Paris to Europe, let`s unite the struggles! 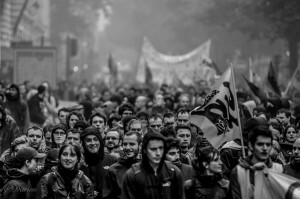 The class conflict in France marks the most recent escalation of the struggle of European movements against the austerity policies of the ruling neo-liberal elites. Ironically, of all countries it is in France, the country of an authoritarian state of emergency and a strengthened nationalist block, where fierce resistance is currently forming against labor law reforms, the so-called “Loi travail El Khomri”. The frontline of the struggle against austerity and precarization, which has shaken the whole of Europe in the recent past, has been pushed further to the North. We support the intensified class conflict under the extremely weak neoliberal government of the Parti Socialiste. There is now a massive opposition to the labor law, which pushed the approval rates of the government to a critical low. In spite of all the governmental attacks – blackmail, police repression and the enforcement of the law without parliamentary debate – unions representing the majority of the workers remain together with the social movements against the law. This struggle gave birth to the #nuitdebout process and the #Convergence des Luttes (“convergences of the struggles”). We see in this movement a rejection of the neoliberal mode of government as a whole, and an expression of a search for real alternatives from below. With the political crisis in France and the momentum of union strikes and blockades in strategic sectors of the economy, the country has almost been brought to a halt. All oil refineries and 16 of the 19 nuclear power plants are affected by strikes, there are temporary blackouts all over France; two-thirds of the filling stations are running out of gasoline, workers in long-distance transport are on a 48-hour strikes, and an indefinite public transport strike is ongoing. The unions have announced a central mobilization to Paris on June 14th. Conservative estimates expect around 500,000 people to challenge the Loi Travail El Komri. This also puts pressure on the government of Manuel Valls. The radical forces in Paris have meanwhile sent out a transnational call for multi-scale blockades to all European movements. On June 11th we will come together in Place de la République and discuss how to make a real transnational convergence of struggles, towards a transnational social strike. The French movement should not remain isolated in its struggle against the precarity and austerity regime; after Greece, Italy and Spain, this has to stop. We have to fight back in a transnational campaign, bringing together trade unions and social movements, migrants and students, precarious and industry workers. Can we find common demands for a transnational collaboration? How to strike and act across the borders? How to reject the precarity and austerity regime? Let’s give ground to a common political initiative and reclaim material democracy.